As I am doing mainly metadata work right now, I figured it would be good to get a better grasp of how the reporting works on the presentation layer, i.e. Answers. To that extent, I've been having problems getting the drilldown reports to work the way I want them to. The problem is that the ID associated with the level is displaying, not the value. 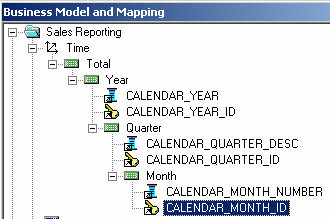 After initially creating it, I create an Answers report with one column, CALENDAR_YEAR. Might be hard to notice, but the year is hyperlinked, I should be able to click it and drill down to the quarter right? That's not what I want. I don't want to see the ID associated with it. That's meaningless to the user. 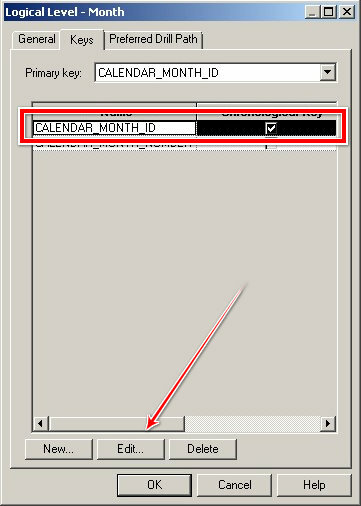 You might be thinking, "What an idiot, why did he make the ID available in the presentation layer?" I just thought of that too...removed it, and I received an error. Anyway, the same thing (%_ID columns showing up instead of their description). Click on Year (again) and I get the Quarters...well, the ID anyway. 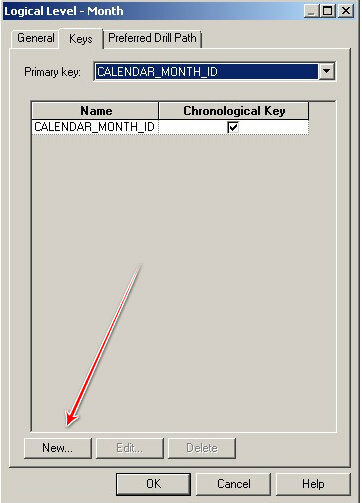 Click on the quarter (ID) and I get the month ID. 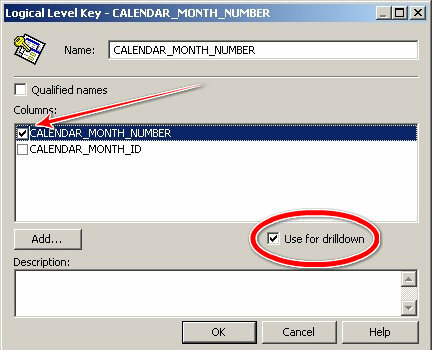 Now check CALENDAR_MONTH_NUMBER and make sure that Drilldown is checked. Rinse and repeat for each of your dimension levels; Quarter and Year. You can use whatever columns you want to display. You don't have to use the Month Number, you could use March instead. There haven't been too many times when I have used the tools provided by Oracle to manage net services. Mostly, I take an existing file and change it to suit my current needs. The biggest reason for this is probably because I never quite understood what exactly was being asked for. The 3 files typically involved are sqlnet.ora, listener.ora and tnsnames.ora which can be found in the <ORACLE_HOME>/network/admin folder. Typically, these files are created by Oracle on installation. Perusing the files that are on my 11.2 installation, they appear to be the default (and I don't believe I have ever had need to modify them). I've seen NAMES.DIRECTORY_PATH before, but it appears that ADR_BASE is new to 11g. I'll have to read up a bit on that one and get back to you. To read up on the different parameters for the sqlnet.ora file, go here. Note the one difference between the two, the HOST. The HOST tells you (or your client tool really) on which server this database resides. If this were a RAC instance, you would see multiple ADDRESS sections. That is beyond the scope of this test however. To read more about the parameters for a tnsnames.ora file, go here. Finally you have your listener.ora file. This file is absolutely necessary on your database server. 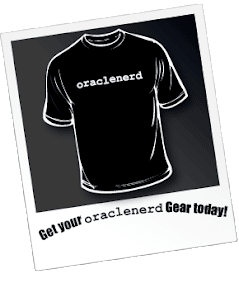 The Oracle Net Listener is a separate process that runs on the database server. It receives incoming client connection requests and manages the traffic of these requests to the database server. Again, the ADR_BASE_LISTENER is new to 11g and requires further research. For even better resource management, shared server can be configured for connection pooling. Connection pooling lets a dispatcher support more users by enabling the database server to time-out protocal connections and to use those connections to service an active session. Further, shared server can be configured for session multiplexing, which combines multiple sessions for transmission over a single network connection in order to conserve the operating system's resources. You cannot have one without the other. 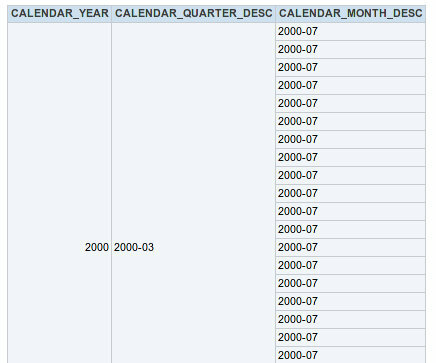 When creating a tablespace, you must specify an associated data file. Likewise, a data file is just a file if it is not associated to a tablespace. 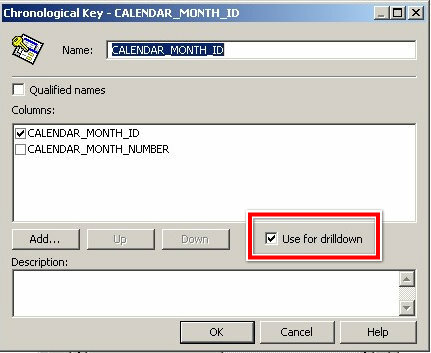 An UNDO tablespace is atype of permanent tablespace used by Oracle Database to manage undo data if you are running your database in automatic undo management mode. Oracle strongly recommends that you use automatic undo management mode rather than using rollback segments for undo. We had our monthly meeting tonight with Jeff Smith from Toad. 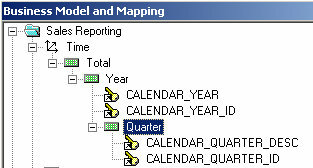 Although I am mostly a SQL*Plus snob, I can appreciate good tools (snicker...wait, that didn't sound right). Ummm...nevermind. No matter how I say it, it's not going to sound right. You know what I mean...get your mind out of the gutter. 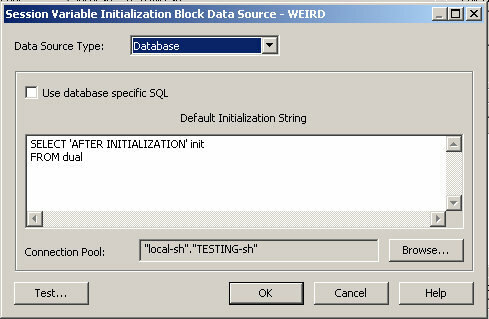 Needless to say, after the Google-like simplicity of SQL*Plus, I had no desire what-so-ever to try it. Like most things, it has evolved. The interface is much cleaner and is (maybe was always?) highly configurable. Let's just say I didn't run screaming from the room this time. I was a Microsoft Access "developer" masquerading as a secretary for a state run university. Access, at the time, was the best thing since sliced bread. When I came to the Oracle world I was "handed" SQL*Plus and a tnsnames.ora file and told to get to work. Where were the pretty pictures? How can I "see" my tables? 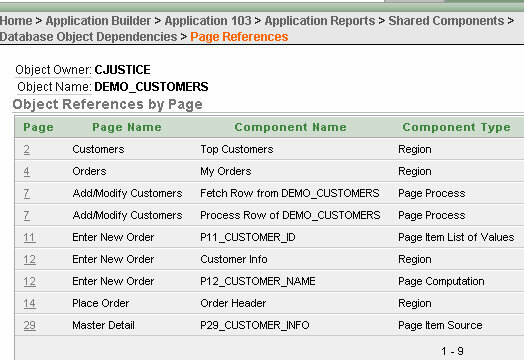 Within a week or two I believe I created an ODBC datasource and used Access as a front-end so that I could "see" stuff. In Mr. Smith's capable hands, Toad didn't look so bad. 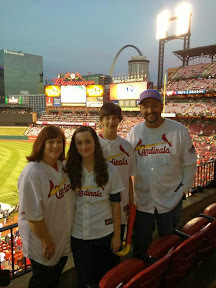 I'm not ready to pay for it yet, but it was much better than I previously thought. The session was informal with Mr. Smith taking a survey of the audience; naturally dominated by those neavil DBAs. I do know, and have used, the DBA module in Toad and found it quite useful. One very cool feature was the ability to generate random data...with referential integrity. Awesome feature if you "like" to test. Building fake data can be a very time consuming process...building data that has RI, well, it is just painful. The best feature was Spotlight. This is more of a DBA tool; it let's you view high level performance metrics and the interface to this is very cool...star trek like. Post-presentation festivities included a trip to the local Mexican restaurant and chance to meet SQLChicken, a local SQL Server guru guy who was born 4 years ago. I haven't shaved in about a month and my beard is completely out of control, so hopefully I didn't scare them too much. Thanks Jeff (and Quest) for extending your stay so you could speak to our group. A profile is a named set of resource limits and password parameters that restrict database usage and instance resources for a user. You can assign a profile to each user, and a default profile to all others. Each user can have only one profile, and creating a new one supersedes and earlier version. 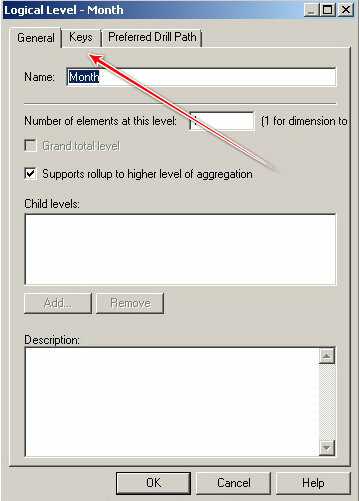 Profiles are used to manage the resource limits of related users. Though password parameters reside in profiles, they are unaffected by RESOURCE_LIMIT or ALTER SYSTEM and password management is always enabled. What is Standard Auditing? In standard auditing, you audit SQL statements, privileges, schema objects, and network activity. 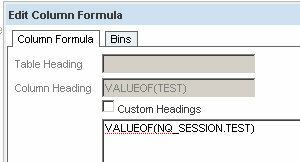 You configure standard auditing by using the AUDIT SQL statement and NOAUDIT to remove this configuration. You can write the audit records to either the database audit trail or to operating system audit files. Who Can Perform Standard Auditing? 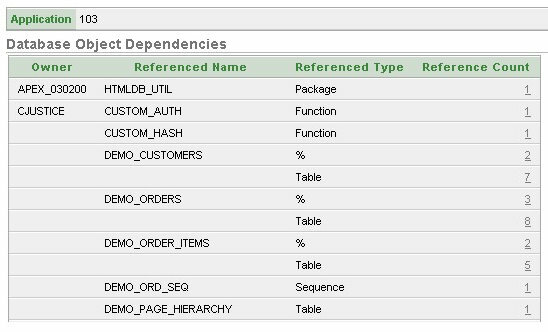 Any user can configure auditing for the objects in his or her own schema, by using the AUDIT statement. To undo the audit configuration for this object, the user can use the NOAUDIT statement. No additional privileges are needed to perform this task. 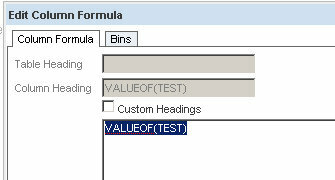 Users can run AUDIT statements to set auditing options regardless of the AUDIT_TRAIL parameter setting. If auditing has been disabled, the next time it is enabled, Oracle Database will record the auditing activities set by the AUDIT statements. When Are Standard Audit Records Created? 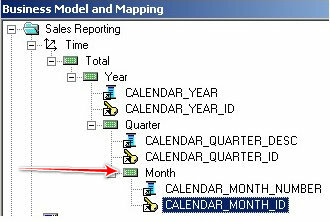 When auditing is enabled in the database and an action configured to be audited occurs, Oracle Database generates an audit record during or after the execution phase of the SQL statement. 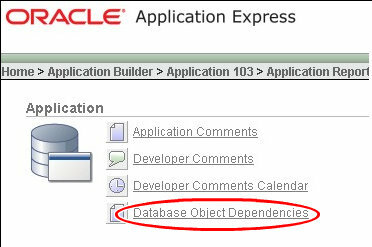 Oracle Database individually audits SQL statements inside PL/SQL program units, as necessary, when the program unit is run. The generation and insertion of an audit trail record is independent of a user transaction being committed. That is, even if a user transaction is rolled back, the audit trail record remains committed. Statement and privilege audit options in effect at the time a database user connects to the database remain in effect for the duration of the session. When the session is already active, setting or changing statement or privilege audit options does not take effect in that session. The modified statement or privilege audit options take effect only when the current session ends and a new session is created. 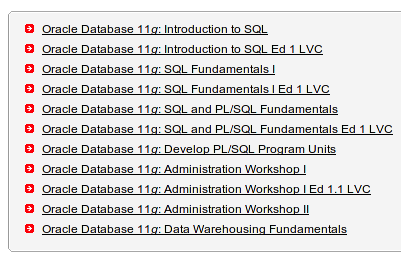 This is the subject matter according the the Oracle website for the Oracle Database 11g Administration I test (OCA). You can find it here. I've also created a "clean" version of it here. Here's the list of books (Oracle Documentation) I have used. I'm tired of understanding enough to know how frustrating it is to not be able to speak to certain topics. I have discussions where I know (or believe) something is not right, but I lack the ability to articulate the reason. That blows. I don't like being in that position...at all. 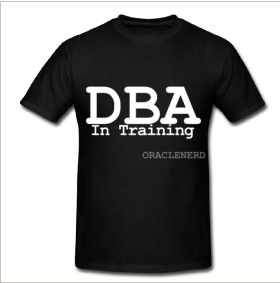 I want to be a real DBA now. Since I am working with OBIEE right now, and I want to continue with that, I have to choose an alternate method to become a DBA. Reading and studying (which I already do), will not suffice. I have no incentive, other than my natural drive. That hasn't been enough though. I can't apply it on a daily basis and continue to work as I do. So I've decided to go the certification route. Now, there are many problems with certification and it seems to be watered down. I have met my fair share of those holding certain certifications who couldn't hit water if they fell out of a boat. My reason for choosing certification is that it will push me to follow through with the training and give me a specific path towards that goal. I believe I started down that path when I first got into IT, but I failed the first DBA test...barely. Then, it was pretty much rote memorization...now, with 7 more years of experience under my belt, it should be a lot easier as I have a better understanding of most of the underlying concepts. Anyone out there taken a similar path? Or were you just thrown into the fire? I would prefer the fire, but I have chosen my path (OBIEE) for now. Mr. Cohen is most famous here for the discussions we've had before about Application Developers vs. Database Developers. Part I is here, Part II is here. Mr. Cohen is a friend of mine. I have a great deal of respect for him. We obviously disagree in some areas, but I've learned to appreciate his push-back and learn from it. He had left a comment the yesterday on my most recent post, The "Database is a Bit Bucket" Mentality (Michael O'Neill posted his followup, Everything is a Bit Bucket, as well). I thought the comment would get short shrift, so I asked him to write up a full post. I deleted that comment and here is his post. Modern RDBMS's are quite powerful today. 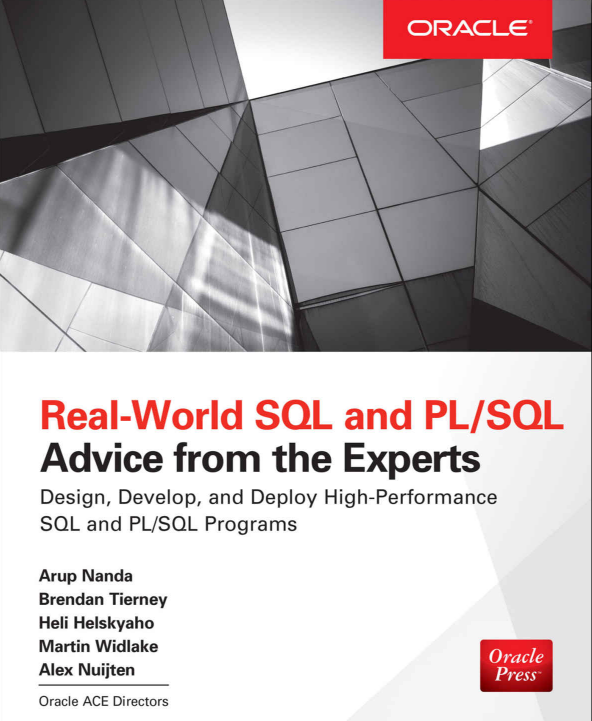 Pretty much every one of them has full support for SQL, including vendor extensions, all of the features we've come to expect from a relational database, a full fledged programming language built in, and quite often support for extras like full text search or native handling of XML. Most now also now ship with highly feature specific add-ons - PostgreSQL has a geospatial package that makes it the defacto standard in that domain, MySql has hot replication in a master-slave paradigm, Oracle has....well, Oracle has all kinds of things, a full object system and Java inside, a message broker, an HTTP server, a complete UI toolkit, among other things. So the question arises as to how much of this capability one should use. I think it's becoming apparent that the answer to this is, "not much." Why shouldn't you take advantage of as much of the database's feature set as possible? The answer is performance and scalability. But wait, aren't stored procedures faster than ad hoc queries? Yes (theoretically). Won't it be more performant to execute business logic as close as possible to the data it operates on? Why should we introduce yet another component into the architecture when the database is perfectly capable of handling a particular task? For one thing, the programming languages and environments offered by relational databases are now relatively long in the tooth, and have been eclipsed by modern OO languages. Developers are much more productive building applications with these new languages, and find it painful and tedious to work within the relational model, with SQL. You can see proof of this now with the overwhelming popularity of ORM frameworks in most of the popular OO languages out there. Java has Hibernate/EJB/JPA and many others. Ruby has ActiveRecord, DataMapper, and Sequel. Python has SqlAlchemy and Djanjo's ORM. And it's not because these developers lack the skills to work with the database directly. Quite the contrary actually, it takes intimate knowledge of the database to work effectively with an ORM. What's more, the ORM is often able to make runtime optimizations that would be difficult or prohibitively time consuming to hand code. Finally, clustered caches offer massive performance and scalability improvements, handling writes back to the database transparently behind the scenes, but for the most part they preclude implementing complex business logic in the database. The overall trend is clear, across languages and platforms. It's the movement of data out of the database and into the application layer. Less and less reliance on the database, perhaps only for archival purposes. John Davies has a good comment on this. He's operating in a unique environment with extremely rigorous performance requirements, but we're now starting to see similar constraints imposed by the web. There's a whole class of software that has come about due to the inability to scale the relational database beyond a certain point. Facebook developed Cassandra, now used by Twitter, Reddit, and Digg, among others. LinkedIn built Voldemort. My employer doesn't deal with the massive scale of these companies, but we do large scale data processing with Hadoop. HBase, another non-relational persistent data store, is a natural fit, and just about the only option really. We use MySql less and less. Of course, not everybody is building applications with such high scalability requirements. But even for applications with less intensive scalability requirements I would argue the same tendency to minimize the workload on the database should apply. Cameron Purdy has a good quote, "If you don't pick your bottlenecks, they'll pick you." Design your application to bottleneck, he says. What he means is, your application is going to bottleneck on something, so you need to explicitly decide what it will bottleneck on. Unfortunately, most applications bottleneck on the database, as this is the hardest layer to scale. It's pretty easy to scale the front end, we just throw more instances of Apache out there. It's a little bit harder, but not much, to scale the app server. But it's pretty hard to scale the database tier, particularly for write intensive applications. For well funded organizations, Oracle RAC is the standard. MySql's master-slave setup and hot replication saw it win out over PostgreSQL despite the fact that Postgres is a much better database in just about every other respect. The NoSql projects listed above grew out of the inability even to scale out MySql. The trend is clear. We're collecting and processing more data than ever before, and this will only increase as we go forward. Unfortunately, the relational database (at least in it's current form) isn't well suited to the scale of data processing an already significant and growing number of organizations deal with on a daily basis. We're now seeing new solutions come forth to address the shortcomings of the traditional RDBMS, and the same forces that have necessitated such developments are at work even in smaller organizations. At all levels, developers would do well to require as little functionality as possible from the database, essentially, to treat it as a bit bucket.